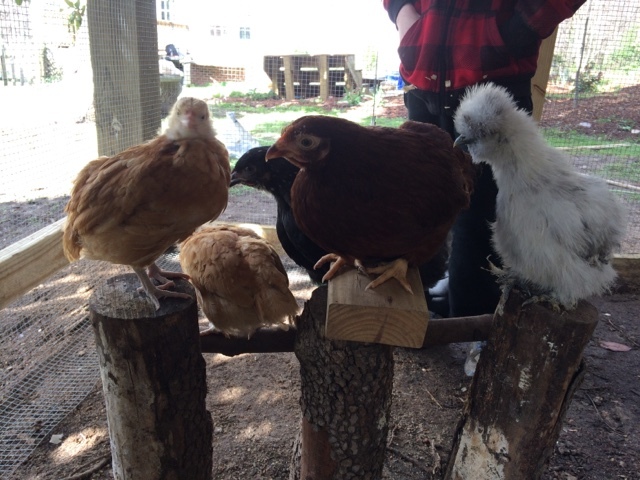 Last weekend we drove up to The Urban Chicken for their Annual CHICK DAYS Celebration and FLOCK SWAP. I had never heard of this before, but just happened to check their Facebook page an hour before the event was supposed to start. 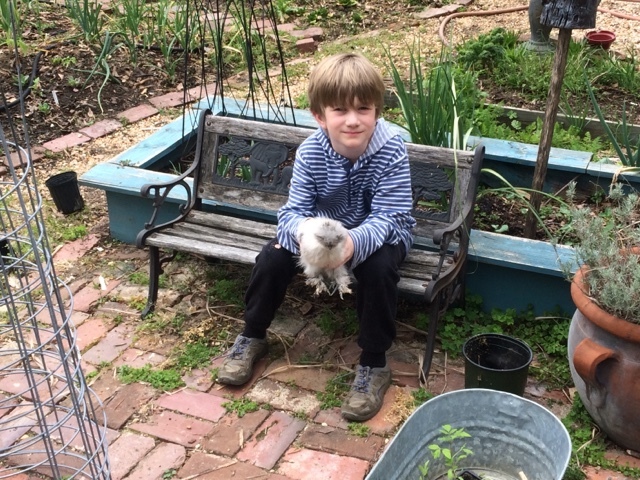 Initially we thought we might wait until the kids were on Spring Break as the coop and run weren't complete, but word slipped out we might get chickens that day, and the kids were so ecstatic, there was no turning back. Under drizzling rain, we loaded up in the car with a cardboard box and drove to The Urban Chicken with the goal to learn exactly what supplies we needed and to talk to a few folks that knew chickens. 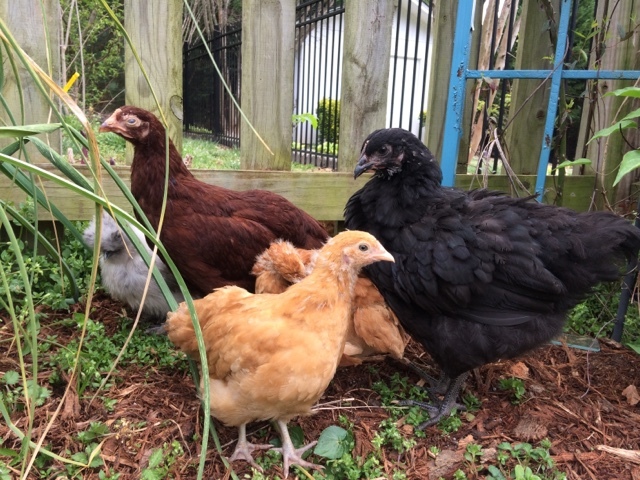 We browsed the several tents with cages of chicks, but the first man from Mebane had the ladies that won our hearts. He told us that Orpingtons and Rhode Island Reds were great layers and docile. 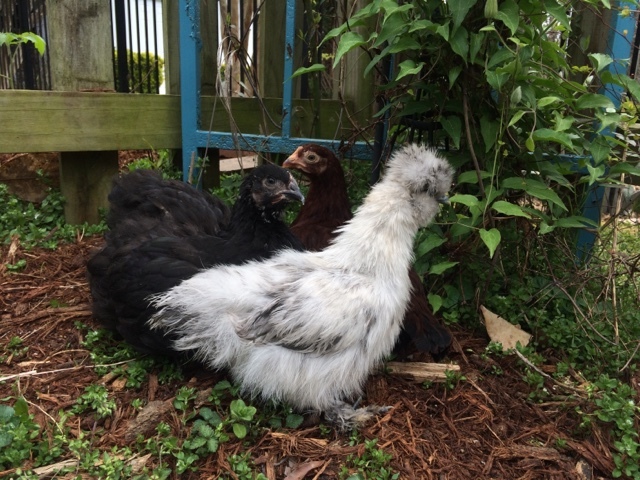 We selected our four, but I felt strongly that I needed a Silkie as well. 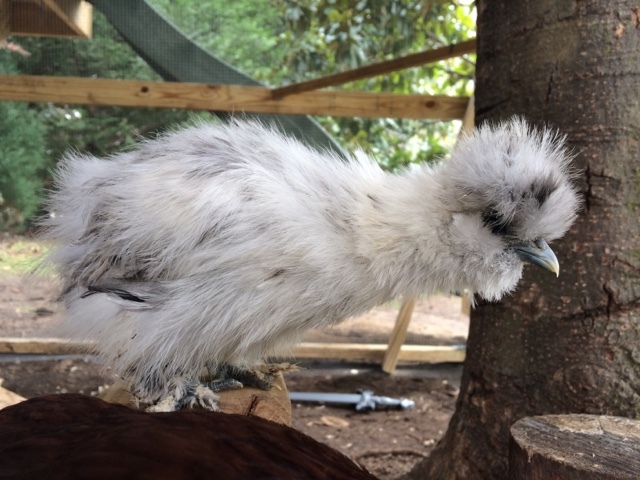 I'd never seen such fluffy chickens, and I just knew that she'd be a favorite. I was right. Luna is loved and gets carried everywhere. My personal favorite is Ruby, the RIR. She is loud and weird and loves to sit on my lap and be petted. 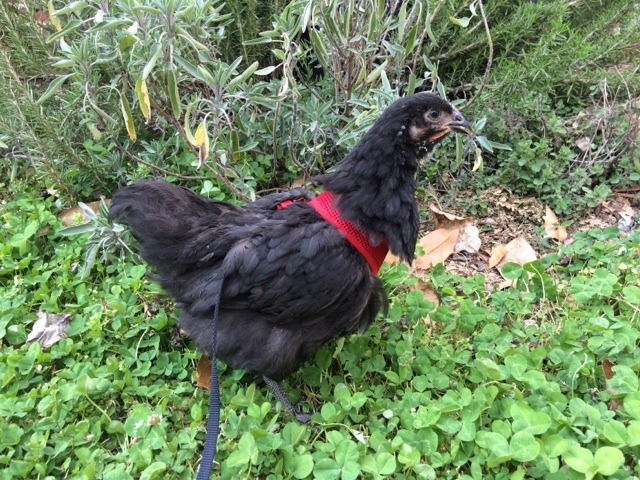 Ms. Bellatrix is ornery and broody and wants to be loved and then doesn't want to be touched. She's the biggest of our flock. She also hates the cat harness. I think she's still holding a grudge days after I put her in it. Luna likes the Ruby and Bella and is always trying to squeeze up in between or under them. She cries loudly when the others go into the coop without her. She also has five feathered toes and is really easy to catch and pick up. The Tweedles are hilarious. 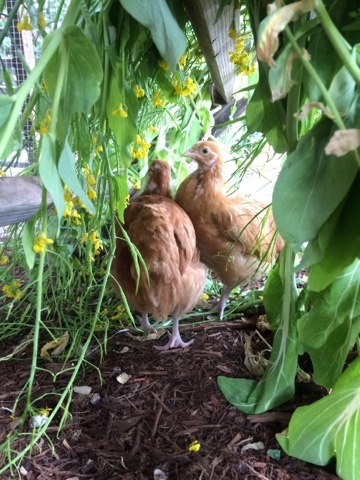 I propped up a large pile of bolted greens on the ladder in their run, and they pecked at it all day, hopping up and down to pluck the flowers. 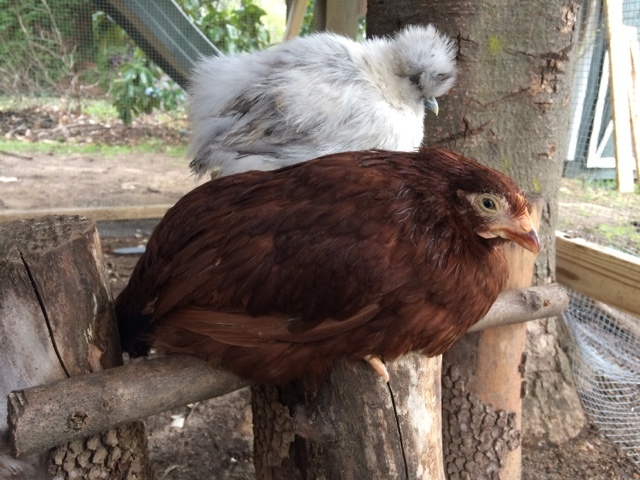 The Tweedles, cross of Buff Orpington and RIR, love garden treats. The Tweedles go everywhere together and cry when they are split up. They stay with the flock but always stay closer to each other. They liked the garden and stayed close together. While they didn't initially like to be picked up and held, they will now rest in the palm of my hand and happily chirp. 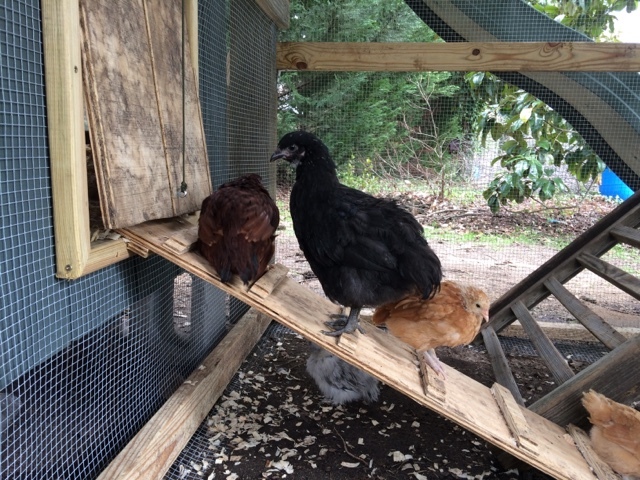 They love being in their coop and for the first few days didn't want to come outside. Now that the weather has warmed up, they spend most of the day scratching around in the run and taking dust baths. Their reply to the being forced out the second day: "Let us in!" I am so glad to find your blog again! I was going through old links today, trying to reconstruct after a big crash not too long ago. I am in the Durham area, so we are close! I loved reading about your chickens! I want chickens some day. Happy Gardening! Thanks for leaving a comment! 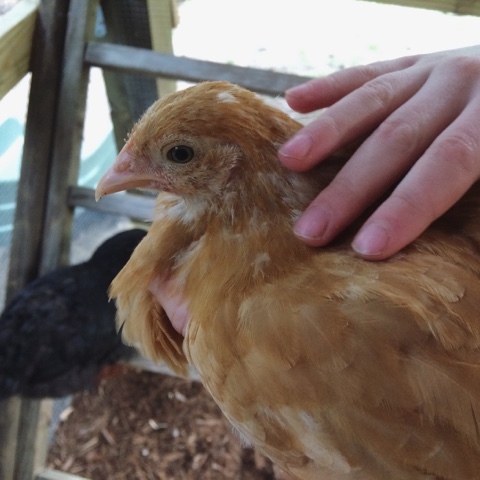 Chickens are easier than I expected, and we have really enjoyed watching them and trying to convince them that being held is wonderful. Durham is close... I buy my clay from Clay Makers on Foster a few times a year.